Iranian President Hassan Rouhani poses during the inauguration a newly built extension of the port of Chabahar, near the Pakistani border, on the Gulf of Oman, southeastern Iran (Dec. 3, 2017). India continues its investment in the Iranian port, but the project’s success is far from guaranteed. With India taking over operations at Iran’s Shaheed Behesti port in Chabahar, New Delhi has reached an important milestone in realizing its economic and strategic ambitions in Central Asia. Operating Chabahar port will provide India with a foothold at the mouth of the strategic Straits of Hormuz, through which a third of all the world’s sea-borne oil passes. China’s presence in this region has grown rapidly in recent years, especially with Pakistan handing over Gwadar port, which is the gateway to the China-Pakistan Economic Corridor (CPEC), to China on a 40-year lease. India’s participation in the Chabahar port project would enable it to keep an eye on Chinese activity at Gwadar, which is just 72 kilometers away. India’s investment, development, and operation of Chabahar port will strengthen its relationship with Iran, its third largest oil supplier. The port is a gateway to an overland trade corridor through Iran to Afghanistan. It will enable India to play a larger role in Afghan reconstruction, which has been restricted hitherto by Pakistan’s refusal to allow India overland access through its territory to Afghanistan. This trade corridor could expand India’s trade ties with the Central Asian Republics (CARs), which currently stands at a meager $1.5 billion, accounting for just 0.11 percent of India’s overall trade. Once Chabahar is linked to the multimodal International North-South Transport Corridor (INSTC), India hopes it will become a gateway for its trade with Eurasia as well. It is estimated that with the operationalization of Chabahar port and INSTC, India’s trade with Eurasia could touch $170 billion ($60.6 billion in exports and $107.4 billion in import). India is developing the Shahid Beheshti terminal at Chabahar over five phases and on completion, the port’s capacity will be around 82 million metric tons (MT) per annum. State-run Indian Ports Global Limited (IPGL) will be responsible for the port’s management for a temporary period of 18 months and if the two sides agree on extending the lease, a 10-year period thereafter. India has provided a capital investment of $85.21 million and annual revenue expenditure of $22.95 toward equipping two berths at Chabahar port for Phase I. It is constructing a $1.6-billion railway line from Chabahar to Zahedan, near the Iran-Afghan border. Besides, Indian private and state-run petrochemical and fertilizer companies are planning investments worth $20 billion in the Chabahar Free Trade Zone. Chabahar’s location gives the port immense economic and strategic significance. Situated at the mouth of the Gulf of Oman on Iran’s Makaran coast, it gives Iran direct access to the Indian Ocean. Besides, even if Iran’s enemies were to shut down the Straits of Hormuz, Chabahar port, being 300 km to the east of the strategic straits would be able to function, reducing Iran’s vulnerability to international pressure. Chabahar port is Iran’s first deep-sea port. Hitherto, Iran’s shipping industry was restricted by the absence of deep-sea ports in the country. Bandar Abbas port, which handles the bulk of Iranian shipping, for instance, cannot receive ships exceeding 100,000 tons. Therefore, high tonnage ships dock at the United Arab Emirates, where the cargo is then loaded on to smaller ships better suited for Bandar Abbas port’s more shallow waters. The deep-sea port at Chabahar will save Iran millions of dollars in fees to the UAE and reduce its dependence on that country. Chabahar port will also reduce land-locked Afghanistan’s dependence on Pakistan for access to the sea. As for the landlocked CARs, which have been relying on ports in Turkey, Russia, the Baltic States, China, and Iran (via Bandar Abbas), the route through Chabahar will provide them with another option and the shortest overland route to conduct their maritime trade. The plan is for Indian shipments to be offloaded at Chabahar port, where cargo would be loaded on to trucks and trains to Zahedan and onward to Zaranj in Afghanistan. Goods can be transported then to any part of Afghanistan via the Ring Road, even beyond, to the CARs. Likewise, goods from Afghanistan and the CARs — the latter have trains that are already linked with the Iranian rail network — reaching Zahedan would be transported overland to Chabahar, from where ships would carry the cargo to India and other countries. It was in 2013 that Iran first put forward to India its plan to develop Chabahar into a regional trade and transshipment hub. It has taken a long time for that plan to become a reality. Western sanctions against Iran, India’s doubts about the project’s viability and differences between India and Iran on the terms of the project have impeded progress. Indeed, even a few months ago, it seemed that the project had run aground again when the United States imposed “the toughest ever” sanctions on Iran. It was only in early November, when the Trump administration exempted Chabahar port and the construction of a railway line connecting it with Afghanistan from the sanctions, that the project got back on track. Several challenges could still derail the project in the coming years. U.S.-Iran tensions and the deteriorating security situation in Afghanistan are the main challenges, Gulshan Sachdeva, professor at the School of International Studies in Jawaharlal Nehru University in New Delhi told The Diplomat. Besides, there is skepticism over the economic viability of conducting long-distance trade over land. While hauling cargo by train may be less time-consuming than transporting it by ship, sometimes taking half the time of the sea journey, the premium one pays for that time saving is far too large to make it worthwhile. It is therefore debatable whether the overland corridor from Chabahar to Zahedan and onward to Afghanistan or the CARs is the most efficient way for India to trade with Central Asia. Key to the future of Chabahar is the frequency of traffic and volume of shipments the port will draw. At present, India is focusing on shipments to Afghanistan but this isn’t enough to make Chabahar port economically viable. It will need to get other countries such as the Gulf Cooperation Council (GCC) member-states to use Chabahar port for trade with not just Afghanistan but the CARs as well. 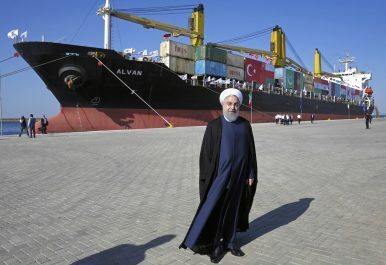 Given their conflicts with Iran, it is unlikely that GCC countries would trade via Chabahar. To tap the Chabahar project’s full potential, connectivity in the region needs to improve but capital deficit issues have kept the Chabahar-Zahedan railway project from gathering steam. The INSTC project is yet to take off. Plus, China could have significant impact on the Chabahar project. Already, its participation in Gwadar port’s construction and operation has implications for Chabahar’s future, with several analysts arguing that in the likely competition between Chabahar and Gwadar ports, it is the latter that holds the advantage. Not only is Gwadar port a decade ahead of Chabahar but also, China’s much larger investment in the port and the speed at which it is constructing roads and rails from Gwadar to Kashgar as part of CPEC puts Gwadar port far ahead of Chabahar in the race to attract business. China could also participate in the Chabahar port project. Iran has made it clear several times that “it would like to invite more players, including China and Pakistan,” to participate in the Chabahar project, Sachdeva said. Iran understands well that unlike India, China will seek complete control over jetties, piers, etc. it invests it, including access to such port infrastructure. Iran, a country that is sensitive on sovereignty issues, is unlikely to be comfortable with that. China is said to be exploring berthing rights at Chabahar but since it has full control over Gwadar over the next few decades, Beijing may not be in a hurry to press for a role at Chabahar. For the time being, at least, Chinese interest in Chabahar is likely to be aimed at riling India rather than furthering a strategic goal. Dr. Sudha Ramachandran is an independent journalist/researcher based in Bangalore, India. She writes on South Asian political and security issues. The nuclear deal opens the door for India, but its neighbors have their own plans. Grading India's Neighborhood DiplomacyIndia, Iran, and the WestChina Is Winning the War for Nepali BuddhismIndia’s Sikh Sensitivities and Canadian PoliticsCan Bhutan's New Government Avoid Doklam 2.0?